What is the role of high priest? What is his role towards people? How do a high priest’s weaknesses effect his attitude towards those who cares for? What application is there here for us? How should remembering our own sins and failures affect how we treat others? Exodus 28, Numbers 16 – Consecration of the priests. Leviticus 16, Exodus 30:10 – The high priest offers atonement for the people’s sins. Matthew 7:3-5 – Take the plank out of your own eye before the speck that is in your brother’s eye. 2. In things pertaining to God – The job of the high priest was a spiritual position. I am reminded that when Jesus came to earth at various times the people sought to make Him king. He didn’t let them. Pilate asked if Jesus was a king (John 18:33-36) and Jesus responded that His kingdom is not of this world. In the same way, a high priest doesn’t focus on the affairs of the world. His focus is on the things of God. His focus is on helping God’s people grow closer to God. There is a subtle reminder here that believers are first and foremost citizens of and ambassadors of heaven. John gives the warning in 1 John 2:15-17 about not loving the world and Paul expresses the same thought in Colossians 3:2. Sometimes ministers may have a hard time balancing these two thoughts. Like in many areas of life it is easy to go too far to one side or too far to the other. Some may pay a lot of attention to the earthly needs of man such as visiting orphanages, dispensing medical help, feeding the poor, helping the sick, etc. All of these things are worthy goals. Yet some Christians who focus on them may forget about the “things of God.” Helping the physical issues is a means to an end of helping these people spiritually. There is a Chinese parable. Give a man a fish and he will not be hungry for a day. Teach him how to fish and he can feed a village. You could add a line on to that, “Teach him about God who made the fish and he need never be hungry (spiritually) again.” So this is the job of the high priest. He teaches people the things of God so that their relationship to God can be restored. At the same time this is a reminder that we have no excuse for not obeying God and serving Him in the area He has called us to. We might be tempted to to make the excuse that we are sinful and therefore not fit to serve God. But even the high priests were sinful and they were still appointed. 5. As for the people, as for himself – The high priest was obligated to offer sacrifices not only for others, but also for himself. A Christian leader must never neglect his own walk with God in order to help others. We will not be able to serve others as effectively unless we have a thriving relationship with God ourselves. Every sermon we preach should be a sermon preached to ourselves first and foremost. Every prayer offered for wisdom, forgiveness, and grace for others should be offered for ourselves as we need the wisdom, forgiveness, and grace as much or more than they do. Every principle we ask others to follow, we should do ourselves. This attitude will not only sharpen our walk with the Lord and help us grow, but it will also humble us and help us become both more dependent on God and more merciful to others. How does one get chosen to be high priest (1,4)? 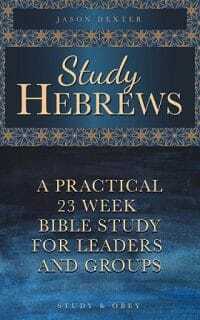 Can a person decide he wants to be high priest, then prepare, study, pass some tests, get the top score, and become high priest? Are there any examples in the Bible of priests that men chose/appointed, but whom God rejected? 1 Samuel 2:34-35 – Eli’s two sons rejected, but God would raise up for himself another priest who would be faithful to Him. 1. The high priest is appointed by God – This principle is seen in verse 4 and in the first part of verse 1. We see that this is first of all an honor. It is not a burden to have to serve others, but a privilege to be able to. We also see that a high priest could not enter this vocation of his own volition. It is not just another career path like becoming a farmer, a soldier, or a banker. You could not choose to do this on your own. You could only be chosen for it, just like God chose Aaron as the first high priest and then chose his line to carry on the priesthood. How might it affect a high priest to know they had been chosen by God? How might this knowledge effect the people whom he served? a) Knowing God chose him, would challenge the high priest to do his best. He should take his position seriously. He should adopt a humble attitude knowing it was not his own ability. He should depend on God who appointed him. He should do it for God and not for man. b) For people, it put God’s stamp of approval on the high priest. That meant that they should respect and obey him. He was the rightful authority in spiritual matters whom even the king couldn’t usurp (2 Chronicles 26:19). 2. What applications are there for us today? a) Do not consider going into the “ministry” like any other career path. For a lot of church history it was just a career. We should do whatever God calls us to and do it with all of our hearts. If we do go into the ministry take it seriously and serve God faithfully for His glory. b) Be respectful and obedient to the God-appointed leaders of the church. Obey in such a way that can give them joy and not grief. What is the relationship between verse 5 and the passage in verses 1-4? Why is it important that Christ did not choose this role for Himself? Is there any application we can get from here about our own service or ministry? Who appointed Christ to this role? Remembering the the theme of Hebrews (Christ’s supremacy), how does God appointing Christ as high priest fit into this overarching theme? What does it mean that Christ is a high priest according to the order of Melchizedek? What were the key distinctives of Melchizedek’s priesthood? Psalm 2:7, 110:4 – Verse 5-6 are quoted from these verses. 1. In verse 5 we start to see the connection that the author is making. He first establishes the roles and character of a high priest and then will go forward to prove that Jesus met the appropriate criteria, therefore proving that Jesus is superior since He is the perfect high priest. 2. We see in verse 5 that Jesus was also appointed to become high priest. (Luke 9:35) God the Father appointed Jesus to this. Throughout the gospels we see over and over again that Jesus came to obey the will of His Father. (John 4:34) This required great humility and submission. As we will see, it wasn’t an easy task. 3. According to the order of Melchizedek – The writer goes into greater detail about this in chapter 7. Read cross-reference. For now it is enough to note that Melchizedek was a priest-king. Aaron’s line were priests, but they were not kings. David’s line were kings, but not priests. The two roles were distinct and separate. Melchizedek performed both roles in his office of priest-king. This is the type of high priest that Jesus was, re-affirming once again His supremacy. Application: List one specific area you need to change in order to obey what God has taught us in this passage.